"Rusha" redirects here. For the Eurasian country, see Russia. SS christening of a child born through the RuSHA's Lebensborn program in 1936. The SS Race and Settlement Main Office, (Rasse- und Siedlungshauptamt der SS, RuSHA), was the organization responsible for "safeguarding the racial 'purity' of the SS" within Nazi Germany. One of its duties was to oversee the marriages of SS personnel in accordance with the racial policy of Nazi Germany. After Heinrich Himmler introduced the "marriage order" on December 31, 1931, the RuSHA would only issue a permit to marry once detailed background investigations into the racial fitness of both prospective parents had been completed and proved both of them to be of Aryan descent back to 1800. The RuSHA was founded in 1931 by Reichsführer-SS Heinrich Himmler and Richard Walther Darré, who later rose to the rank of SS-Obergruppenführer. In 1935, it was upgraded to an SS Main Office. Under its first director, Darré, it propagated the Nazi ideology of "Blood and Soil". Darré was dismissed by Himmler in 1938 and was succeeded by SS-Gruppenführer Günther Pancke, SS-Gruppenführer Otto Hofmann in 1940, and SA-Gruppenführer Richard Hildebrandt in 1943. The RuSHA was created in part to monitor Himmler's 1931 order that the marital decisions of unmarried SS men should be supervised by the Nazi state. SS men would thereafter have to apply for a marriage permit three months before getting married so that the parents of the fiancée could be investigated to ensure her racial purity. With time, the marriage laws became less strict. 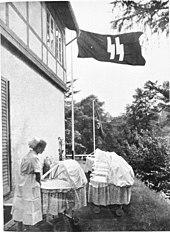 Thereafter, in December 1935 Himmler ordered the RuSHA to establish the Lebensborn network of maternity homes, whose purpose was "to accommodate and look after racially and genetically valuable expectant mothers." The RuSHA increasingly focused on processing SS marriage applications, genealogy, "racial-biological" investigations and the social welfare services of SS members. Babies born during the SS Lebensborn program in 1943. Rassenamt (Racial Office), it selected future SS personnel and conducted racial selections. Heiratsamt (Marriage Office) it controlled the selection of suitable wives by SS men. Siedlungsamt (Settlement Office), it dealt with the settlement of discharged SS men, especially in the annexed eastern areas. The Race and Settlement Departments were further divided into the Hauptabteilungen (Main Branches). One of these managed welfare and pensions in cooperation with the SS-Hauptfürsorge- und Versorgungsamt (SS Main Welfare and Pension Department) at the Reich Ministry of the Interior. By 1937 more than 300 SS men had been expelled from the SS for violating Nazi race laws (Rassenschande), although an order later stated that they could remain if they were already married and could satisfy racial criteria. In November 1940, Himmler reinstated all SS personnel expelled under the marriage laws, provided they met racial requirements of the Nazi Party. Following the invasion of the Soviet Union in 1941, the RuSHA worked in partnership with VOMI in the "germanization" of captured territory, monitoring of settler welfare, and the plantation of ethnic Germans in areas designated for settlement by the SS, particularly in occupied Ukraine. This involved in part, the resetting of Germans in the Nazi occupied Eastern territories and ejecting the native families from those lands. The RuSHA also employed Josef Mengele for a short time from November 1940 to early 1941, in Department II of its Family Office, where he was responsible for "care of genetic health" and "genetic health tests". He went on to become one of the team of doctors responsible for the selection of victims to be killed in the gas chambers and for performing deadly human experiments on prisoners at Auschwitz concentration camp. Some of the 14 defendants in the RuSHA Trial at Nuremberg read the indictments against them in July 1947. In July 1947, 14 officials from the organization were indicted in the RuSHA Trial and tried by the Allied powers at Nuremberg. All were charged with crimes against humanity, war crimes and membership of a criminal organization (the SS). All but one (who was acquitted on the two more serious charges) were found guilty and sentenced to between three and 25 years imprisonment. Generalplan Ost – the Nazi plan to ethnically-cleanse occupied Eastern Europe. ^ Michael Burleigh (7 November 1991). The Racial State: Germany 1933–1945. Cambridge University Press. p. 84, 273,. ISBN 978-0-521-39802-2. ^ Zentner & Bedürftig 1991, pp. 146, 576, 747. ^ Zentner & Bedürftig 1991, p. 747. ^ Zentner & Bedürftig 1991, pp. 534, 747. ^ Schmuhl, Hans-Walter (2008). The Kaiser-Wilhelm-Institute for Anthropology, Human Heredity and Eugenics, 1927–1945: Crossing Boundaries. Springer. p. 364. ISBN 1-4020-6599-X. ^ Snyder 1994, p. 227. Law Reports of Trials of War Criminals: United Nations War Crimes Commission. Wm. S. Hein Publishing. 1997. p. 5. ISBN 1-57588-403-8. Zentner, Christian; Bedürftig, Friedemann (1991). The Encyclopedia of the Third Reich. New York: MacMillan. ISBN 0-02-897500-6. This page was last edited on 6 February 2019, at 11:50 (UTC).